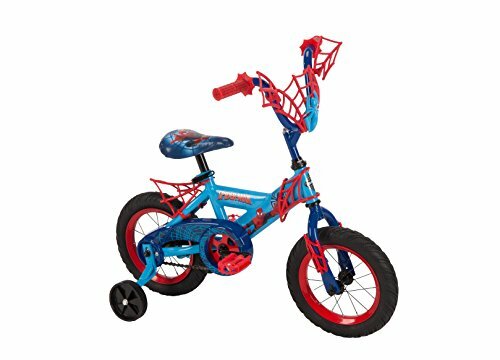 This spider-man bike is web spinner blue, superior blue, and scarlett red with web grips and web tread tires. The Marvel spider-man components have fun and innovated hooks to attach toy figures to webs. It has 12" x 1.95" tires, 16-spoke Black and red rims, and wide training wheels which add stability. Marvel Spider-Man web handlebar detail includes hooks for attaching action figures - an easy way to bring them for the ride. A padded seat featuring Spider-Man graphics, web detail grips, and the eye-catching colors make it so much fun to ride. The 12" web detail tires, sturdy training wheels, and an easy-to-use coaster brake make riding comfortable and build confidence for beginning riders. Fully decorated with Marvel Spider-Man graphics, the durable steel frame is built to last, and backed by our limited lifetime warranty. Barbie Dynacraft Bike, Pink, 18"
Huffy Bicycle Company Pro Thunder Single-Speed Boys Bike, Neon Orange, 16"